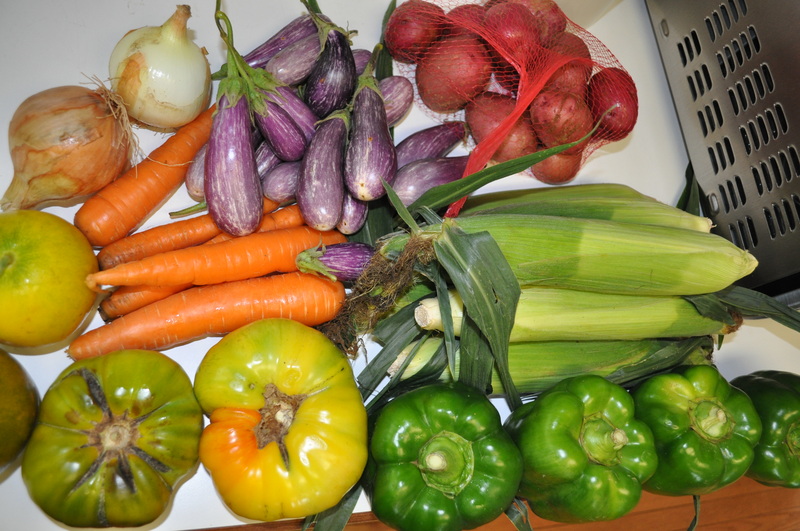 I didn’t forget about my CSA basket last week. I just have been so busy with other things I haven’t recorded it. Lancaster Farm Fresh delivered another large varied basket of goodies to our pick up site. This is what we got, and what I have done with some of it. The fruit share. An add on. 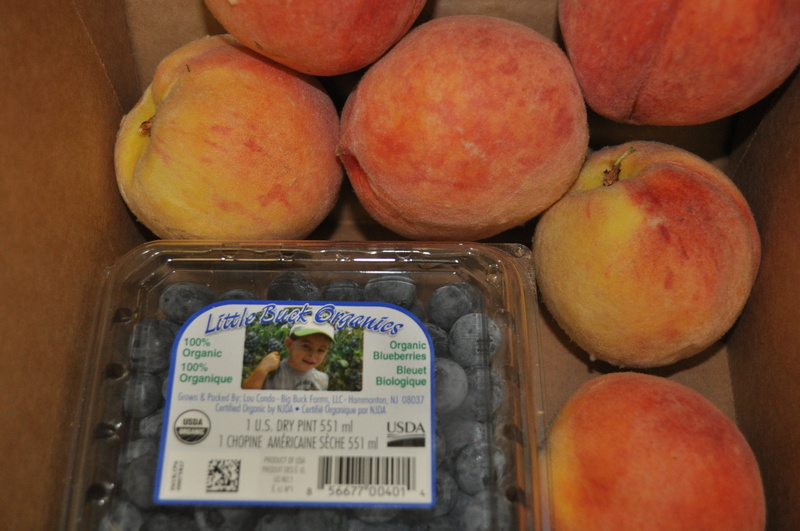 Peaches and blueberries this week. They are destined to become popsicles later this week. I am waiting for the peaches to ripen just a bit more. And, making blueberry syrup out of these berries. A blueberry swirl in the peach and yogurt pops. Heaven knows, I don’t need more zucchini around here. The tomatoes are gone. Sliced and covered with chicken salad, made using this week’s chicken breasts. Two days worth of lunches. The corn has been boiled and eaten for Sunday night dinner, plus the extra ears will be part of a salsa later this week. A few of the potatoes made it to Sunday’s dinner as well. Tomorrow I will be grilling those cute baby eggplants with a few steaks and potatoes, to celebrate the 35th anniversary of the day I met my husband. Opening some old wine that pairs well with steaks. I am considering blanching, dicing and freezing the “trinity”. To use this winter. Peppers, onions and carrots. A good mix for soups, stews and other one pot dishes. All in all, the summer bounty this year is being put to good use. Not a bad week’s half share. I am crossing my fingers though, and hoping we get a watermelon this Thursday. It’s that time of year again. Posted in CSA, Food, LFFC and tagged cooking, CSA, Food, foodie, heirloom tomatoes, tomatoes. Bookmark the permalink.